USTA Immediate Past President Jon Vegosen presented the award to Li Na. The USTA has announced that Li Na has received the Second Annual U.S. Open Sportsmanship Award, presented to the male and female professional tennis players who best demonstrate excellence in sportsmanship throughout the Emirates Airline U.S. Open Series and the U.S. Open. 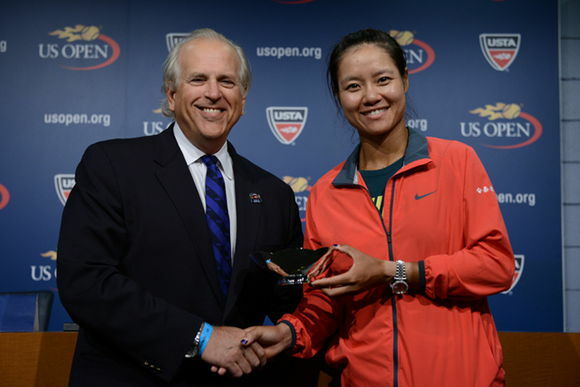 The award was presented to Li today at the US Open by USTA Immediate Past President Jon Vegosen. "As one of the most successful and respected players on tour, Li embodies what a champion truly is," said USTA Chairman, CEO and President Dave Haggerty. "We couldn't be happier to honor her with the US Open Sportsmanship Award." The USTA started a Sportsmanship Committee in 2011, with the goal being to, "educate and inspire youngsters and their parents to develop and exhibit a high degree of sportsmanship and an attitude of fair play and mutual respect on and off the tennis court. Underlying the charge is the ethical imperative that fairness is more important than winning." The champion at Roland Garros in 2011 is one of China's most popular athletes, a symbol of modern female independence to country with a population over one billion people. Eligibility requirements for winners include participating in at least two Series tournaments, as well as the 2013 U.S. Open. Each U.S. Open Sportsmanship Award winner receives a trophy and a $5,000 donation to the charity of his or her choice. The men's winner this year was David Ferrer. The 2012 winners were Bob & Mike Bryan and Samantha Stosur. Li Na will face Serena Williams Friday afternoon at Arthur Ashe Stadium in the semifinals of the 2013 U.S. Open. Regardless of the outcome of her semifinal showdown with defending champion Serena Williams, US Open semifinalist Li Na will already have one trophy for her mantle.